If you have ambitions of becoming a polyglot but you're not quite sure where to begin, we have good news for you - your smartphone can be of great assistance if used correctly. A few words of advice before we begin - the best results in language learning come with the right mindset. Do not regard it as a chore or do it solely for the benefits, whatever they might be for you. Also, do not bore yourself. Instead, look for ways to make the process fun. Try to embrace the journey, become passionate about it, and expose yourself to a little bit of your target language each day. It does require some patience, but if you stick with it, success will follow. With that out of the way, let's begin! Drops is one of the newer language learning entries, but despite this newcomer status, it has soared in popularity over the last several months. Last year, the app took home Google Play's "Best app of 2018" award, and for good reason. The sole focus of Drops is to teach you vocabulary, and from our experience, it manages to do so quite well. Here's how it works - when you enter Drops, you get to pick a language and then a category of words you're interested in. After you make your choice, the app starts to slowly feed you with words that are in the category. The first time you learn a new word, you see an image and hear a vocalization of it. In addition, you can also see how the word is spelled and then translated into your own language. From there, you can choose to start learning it or scrap it if you know it already or aren't interested. Once the learning begins, you'll have to match the words with their corresponding image, tap letter bubbles in order to form words, and use all sorts of other mobile-friendly mechanics so you can drill the vocabulary into your head. We like this approach because it's easy, extremely visual, accessible, intuitive, and there's no typing involved. 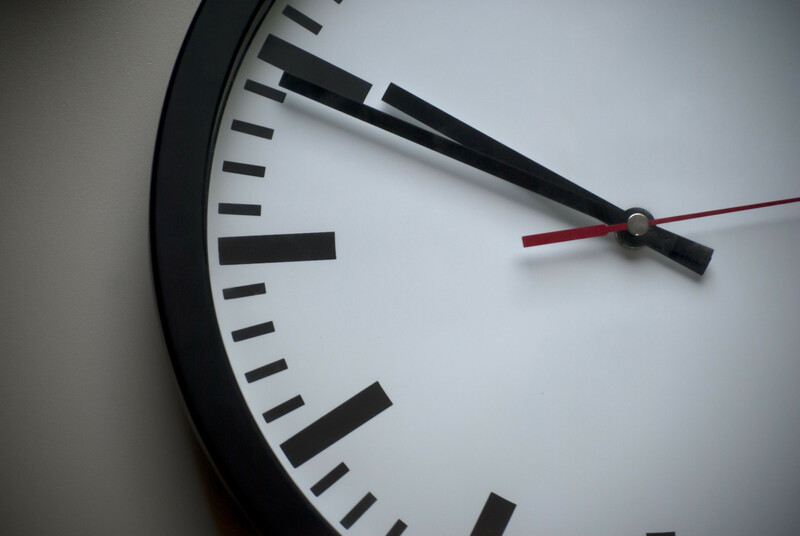 The free version of Drops places a 5-minute-per-day limit on your learning process. In our experience, this is more than enough when combined with another language learning app. If you choose to go for the Premium version, the limit is removed, the ads disappear, and you get access to more word categories, language packs, and a "dojo" where you can practice words that you find hard to learn. If Memrise is the flashy new kid on the block, Duolingo is the tried and tested veteran. It boasts many of the features you will find in Memrise in addition to a plethora of grammar lessons where you can practice forming sentences. Duolingo does not have any features that are hidden behind a paywall. Instead, you'll have to watch ads to support the developers, which is a "price" many of you might be willing to pay for the full experience. 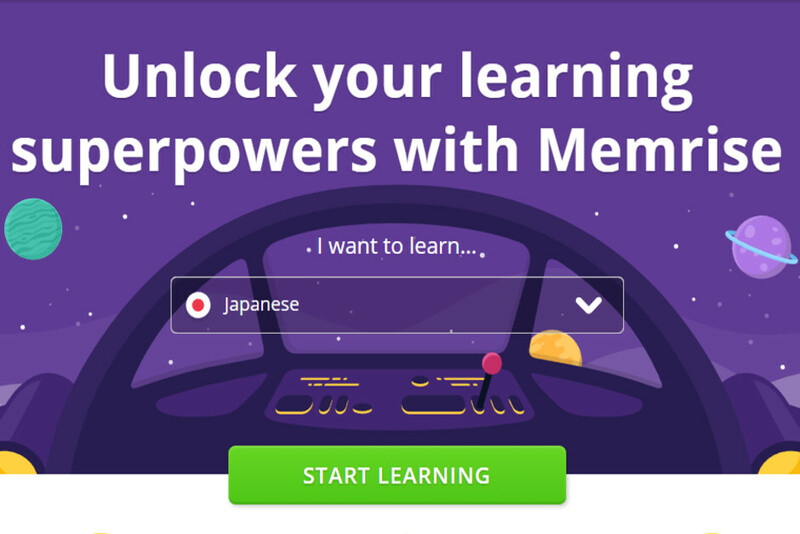 Vocabulary lessons are not always focused on the practical here, so you might want to go with Memrise if you're traveling to another country and want to learn useful phrases sooner rather than later. Don't let the strange name fool you - busuu is quite possibly the most complete language learning app on mobile today. As with Duolingo, busuu tries to pack everything needed for learning a new language with the addition of help from native speakers. 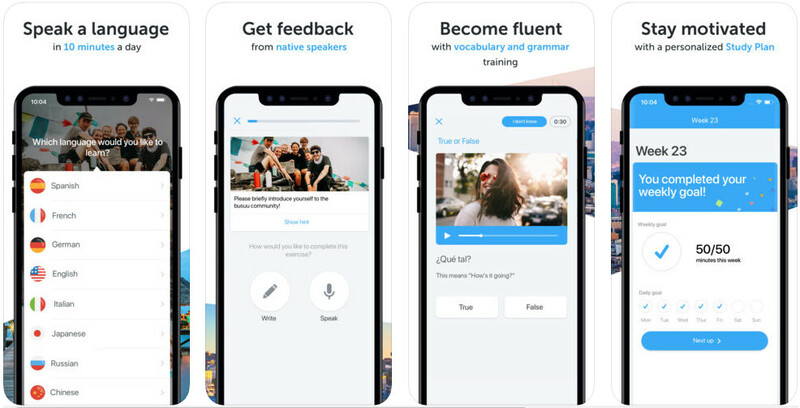 There's a social aspect to this app that allows natives to correct your audio and text assignments, and you can decide to help people out with your knowledge as well. You can even add users to your friends list so you can help each other out along the way. After you learn, memorize, and practice the concepts in a given lesson, placement tests and assignments are then provided to assess your skills. busuu also offers courses that can take you up to B2/upper intermediate level in most languages. If you have a specific goal in mind and you can pledge to use busuu for an X amount of minutes each day, the app can calculate how much time it would take for you to reach said goal and offer a personalized course. We really appreciate the clean interface of busuu. Each new word you learn is accompanied by images and vocalizations in addition to an example sentence where the word is used. The examples are especially useful for languages that have a different and more difficult grammatical structure (looking at you, German). Some of these features are reserved for the premium version of busuu, but you can still get a good feel of the app without paying anything. Good discounts on the premium subscription can often be found inside the app. Find a free online course for your desired language. It's best if it contains audio lessons and features lots of dialogue. Flashcards are very effective. These apps feature algorithms with Spaced Repetition Systems (SRS) - a method that feeds you words and information before you would forget it and makes sure that it stays constantly fresh in your mind. They are a great tool when combined with any type of vocab learning. The other apps described in this article have their own flashcard systems, so you can use Anki or other flashcard apps in any other situation, be it classroom learning, self-study, and so on. If you struggle to find free time for learning a new language, you're not alone. A lot of us lead busy lives, but what's also true is that usually, there are a few free niches that we can utilize throughout our day. You only need to invest 10-30 minutes per day to get going. That might not seem as much, but when you do it consistently, the results will surprise you. Do you commute? Can you spare some time before breakfast, lunch or, dinner? Heck, do you have anything productive to do while sitting on the toilet bowl? Our suggestion is to think about such pockets of free time and then make a habit of using these apps in a way that won't interrupt your daily schedule. Start slowly, and see if your progress will inspire you. We recommend using a vocabulary app in combination with a more complex app. Try the above titles, see which ones you like the most, and start using them daily. After you make a habit and stick to it, advance to the next step. 4. You've learned some words and phrases. Now what? Alright, so you already know some salutations, questions, and popular words in language X. Now what? Well, start using them, of course! Yes, we understand that you might think it's too soon and you don't want to look like a fool. Learning a new language is no cakewalk, and you want to take it slow and ace it on your first attempt. This is a noble, yet misguided idea. Just think about it! If you never make any mistakes, you'll struggle to learn anything new. And besides, the apps we have for you put your conversation partners in a situation similar to yours. Read on! HelloTalk is the top social app for language learners. 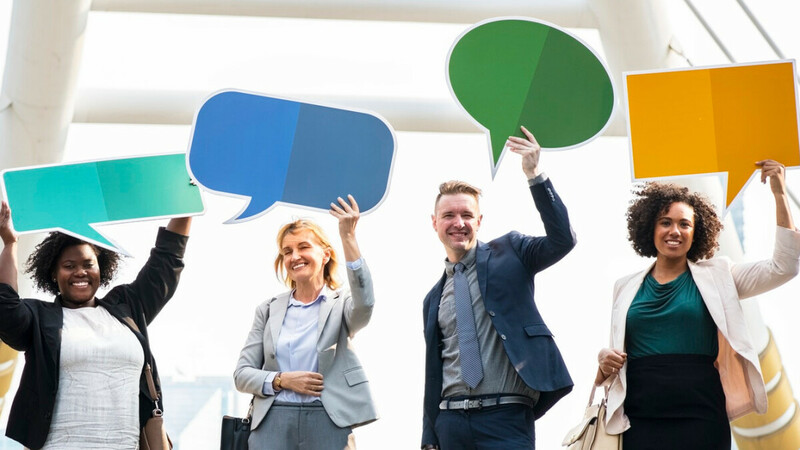 With a user base of more than 10 million and more than 150 supported languages, it's easy to find a native speaker that you can converse with. For the best results, it's advisable to chat with people who want to learn your native language. 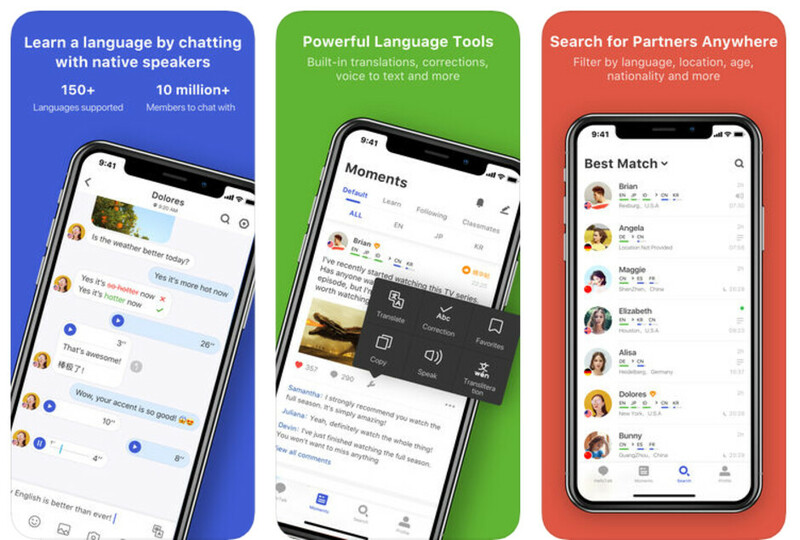 This IM chat app reminds us of WhatsApp and packs features such as correction tools that you and your chatmate can use, voice chat, translation and transliteration systems, and even doodles for the times when words simply don't cut it. You can even refine your tutor search by age and country. If you ever have a question about the language you're trying to learn, you can always ask away in HiNative. 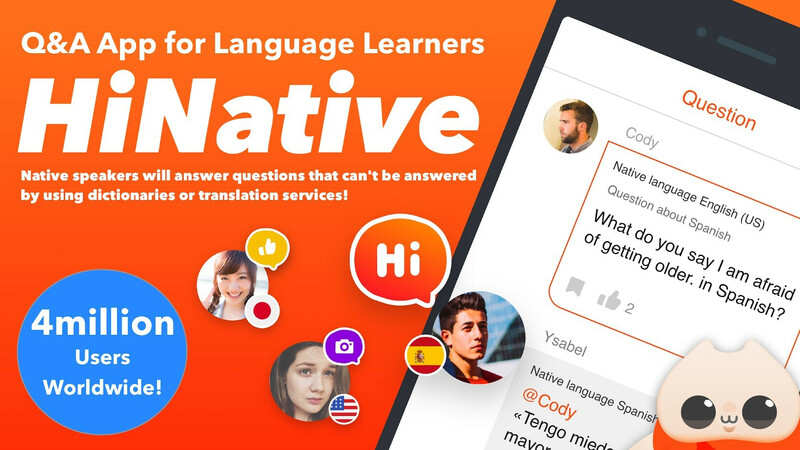 This app sort of reminds us of a specialized version of Quora, as it can connect you with native speakers from around the world. Your questions will be answered without the need for searching for a particular chat partner, which is quite convenient.